1 pack of Randys Roots KING SIZE Papers (Brown). Includes 24 wired papers. Randys Roots Wired Papers are 100% hemp and 30% thinner than Randys Classic paper. Enjoy a natural smoking experience. Randys Roots are natural and wired. 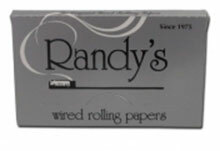 1 pack of Randys Classic Papers (Silver). Includes 24 wired papers.